The problem with Landmarks is that it is so inconsistent and arbitrary. On one hand you’ve got warehouses and parking garages that are protected because they happen to lie within historic districts. While on the other, you have gorgeous buildings that are torn down or defaced because they are not protected. Christ, this will take a while. Another update at last. We’re up to about 807 buildings now. So first up is the Hudson Terminal. I added the interior best I could, and added the lower levels where the tracks are. 2(?) staircases down were omitted because of the angle. They would lead directly on to the tracks. Here you’ll see shaders makes the lowest level look most realistic, but I’ll get to that more in a bit. Around the lobby and main entrance hallways are where stores and other spaces were. This one is from the north building, looking at 22 Cortlandt Street and the Singer and City Investing Buildings. Also from the north building showing 55 Church Street. I’ve never really mentioned this building before, but it was demolished in 1984 for the Millenium Hilton. The Edgar House was the 800th building. Not much but a puny neoclassical box, but pretty cute. Next is the Standard Oil Building. I finally added it. I only have one picture of it currently saved here, but it gives an idea of how massive it is. A very great addition that I’ll post more pictures of in the future. Next is back at the site of 140 Broadway. I’ve had all 6 of these buildings done for over a year, but the back two bugged me. So I took the logical solution and completely erased them from existence and built them anew. They came out much better. I also got this picture of the Mutual Life Building while we were demolishing and rebuilding. Chase Manhattan stands here now. Currently I’m working near Maiden Lane and John Street, now, finishing that area up. Now for the interesting bit: I finally got shaders. I never cared to know they were possible on Xbox, but my buddy SeventeenSpider showed me the way to get them, So props to him. These 3 are from the 1966 copy I have from last summer, if anyone remembers that. I revisited it to see how boxes look in these shaders, and they look pretty damn good. Great update! I love all the small details. It’s crazy how you were able to translate all these miniscule details onto Minecraft. 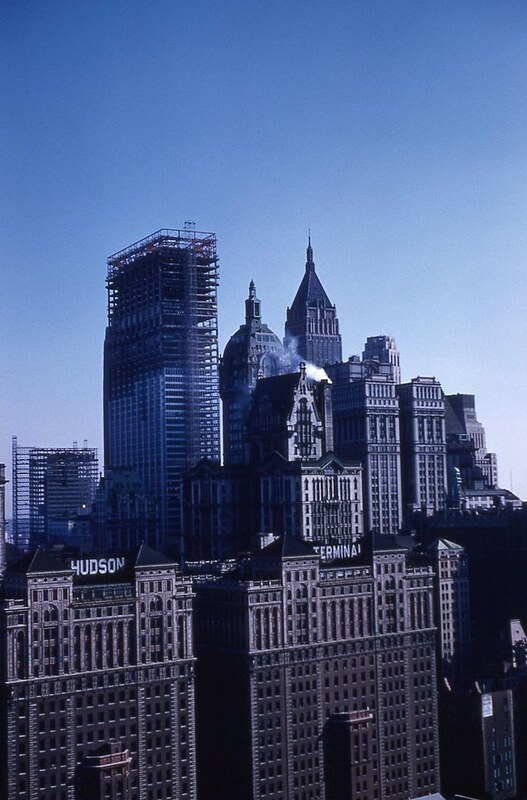 Great job The Hudson Terminal photos look like postcards! Thanks lol. The terminal took an eternity. I found this recently. I’m confused as to where exactly it is. 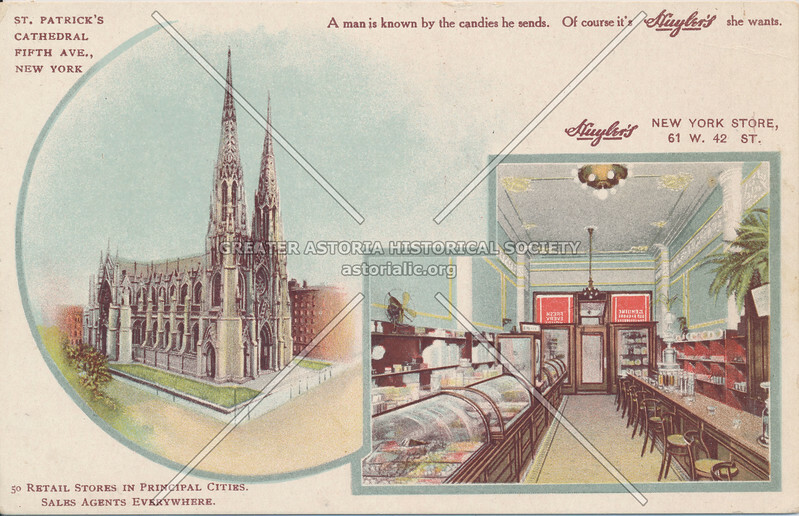 It says the Singer Building, but the address 152 Broadway would be across the street where 150 Broadway stands. If it is in the Singer Building, it might be in the Liberty Street side or maybe the Bourne wing(further down Liberty). 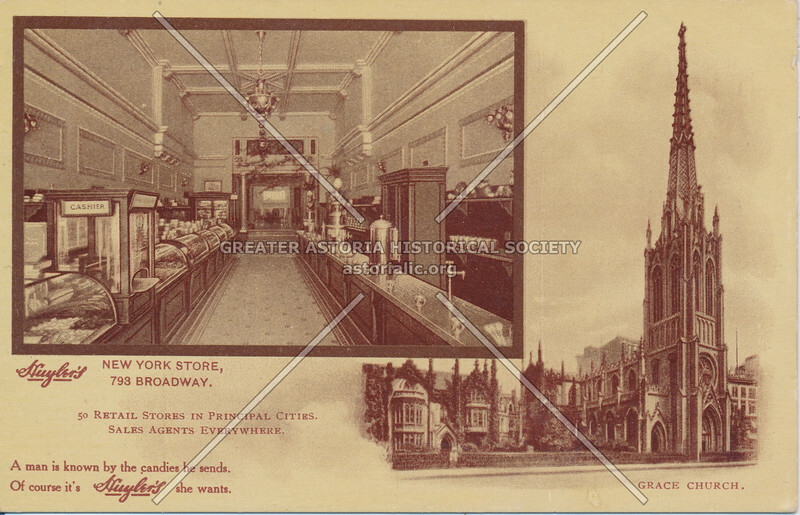 Anyone have any ideas where this store could be? New discovery. Apparently the 2 old buildings on the site of the 1968 BP Garage were demolished in 1953. It also turns out the Gas Station next to the Tunnel portal most likely wasn’t in existance until the end of 1954 or early 1955. I’ve been thinking a bit. Maybe I should try another year change (a phrase I abuse a lot I know) to either 1952 or 1953. You did some awesome updates! I believe that postcard is just showing landmarks of the city, some of them just near to the store, like the one you posted here. 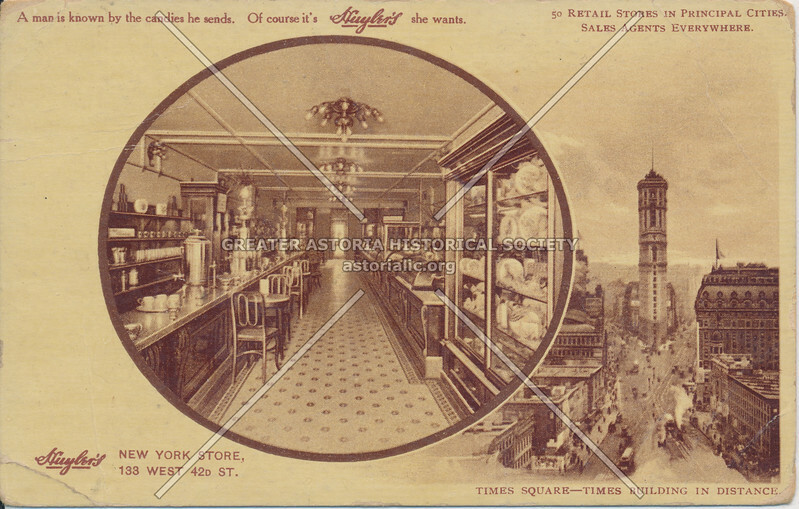 I searched about it on Google and other postcards from this same store appeared showing other landmarks with different addresses as well. Thanks and thanks again. It made me curious: It made me curious as to how it linked with the building. Here’s a little blast from the past: these are from the first week of the map that I still have saved. 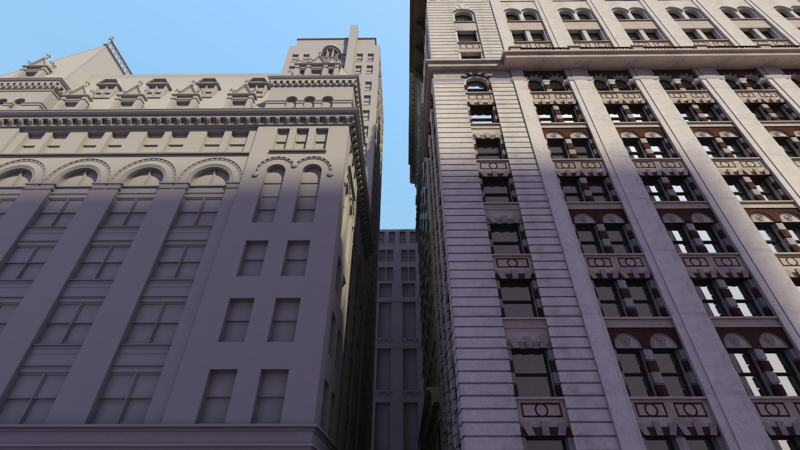 I realized that though Singer was the first building I added, 135 Broadway was finished before the last windows were added to Singer. Technically 135 Broadway was the map’s first completed building. Looking at this makes me want to change the year to 1962 again. The original plan, so long ago. Especially this picture, I had imagined this small swarm of buildings anchored by the Singer and Chase Towers. Shame. 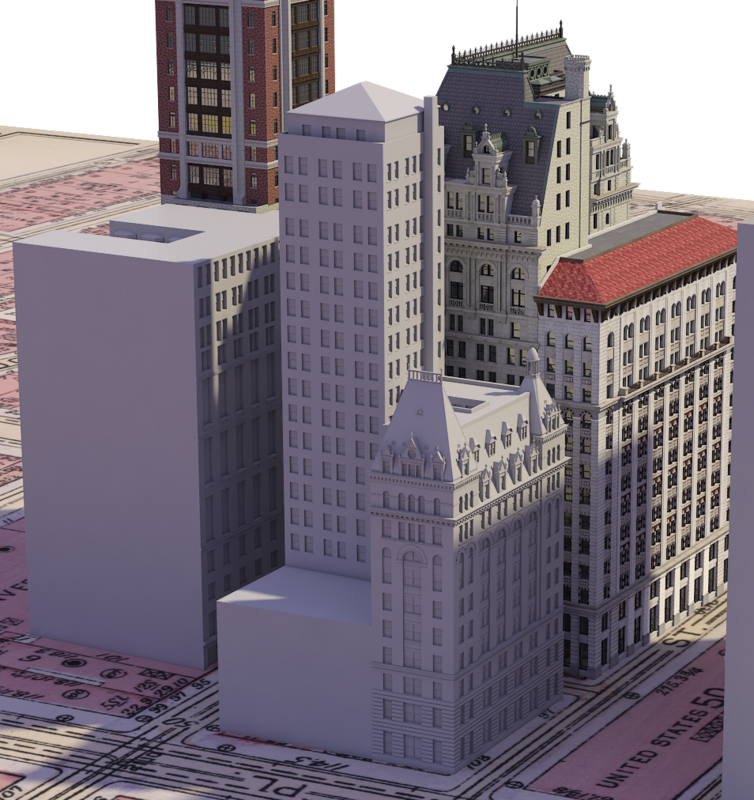 Probably the website where I show my models the most is on Simtropolis, but they’re usually already converted to isometric angles to add in SimCity 4. Every image I make is actually hosted on Flickr. Here are the Vanderpoel Estates, next to the Casualty Buildings. The one on the corner is a darker white, but both are white colored. Edit to post: I’m not going to do the year change that I brought up, too much work as well as the fact that I love the highway and the tunnel way too much to sacrifice them. Rather than make another update I thought I’d just cover over the post. The year will remain 1953.